Numerous studies and personal experience have shown that low-carb dieting is a fast, safe and effective way of losing weight and keeping it off. The problem for many people is finding replacements for all those high-carb meals they used to cook, without eating the same dishes for every meal or spending hours in the kitchen. This collection of quick and easy recipes for everyday meals should prove valuable, whether you are cooking for one, or a busy mum with fussy kids to feed. Ingredients are all readily available and most are inexpensive, contrary to the often held belief that following a low-carb diet means a higher food shopping bill. 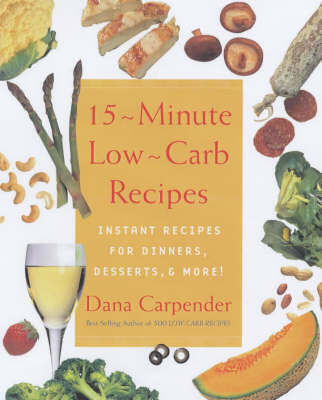 15 Minute Low-Carb Recipes: Instant Recipes for Dinners, Desserts, and More! 15-Minute Low-Carb Recipes: Instant Recipes for Dinners, Desserts, and More! 200 Low-Carb Slow Cooker Recipes: Healthy Dinners That Are Ready When You Are! Dana Carpender's Carb Gram Counter: Usable Carbs, Protein, Fat, and Calories - Plus Tips on Eating Low-Carb! The Low-Carb Diabetes Solution Cookbook: Prevent and Heal Type 2 Diabetes with 200 Ultra Low-Carb Recipes - All Recipes 5 Total Carbs or Fewer!